The remarkable character of Usdi from Episode Six was handcrafted in Greeley, Colorado by the team of Ed Edmunds and Marsha Taub-Edmunds, the driving force behind Distortions Unlimited. Usdi was made from 12 different pieces formed around a 50-gallon drum. 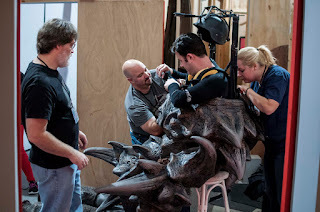 It took three months to “bulk up” the sculpted character to full size and then molds were made of the finished character in order to create a latex and foam version for use on screen. Ed Edmunds says his shop has made large things before – including a 20-foot skeleton – “but we’ve never made a costume this big. I have a passion for creatures like this. STAR TREK and Spock was a huge influence on me. So was Planet of the Apes. I was offered a scholarship to make monsters for art credit. I went to college in Greeley to be an art teacher and making masks was just something I did on the side. But this has become the career that I was supposed to have." And what was it like to see Usdi come to life on the Enterprise itself? “Greg wanted certain things on the creature to move, so our technical guy worked with a lighting company on the effects,” Ed Edmonds explains. 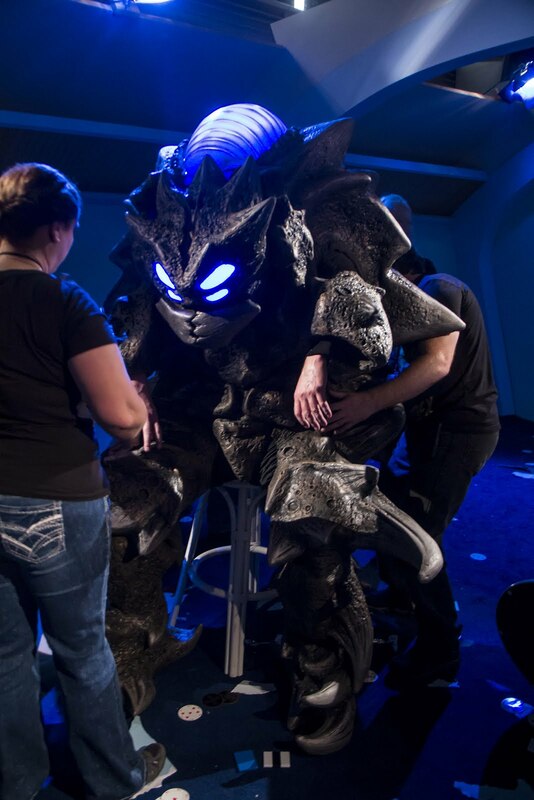 The full-size Usdi could be controlled off camera to change lighting colors. The actor inside utilized a “first person view” system, pioneered in the drone industry, to see on a screen inside the suit what the Usdi character could see. Excellent model and crafting - the lighting for emotions was a simple and perfect in-camera effect, much like classic TOS.